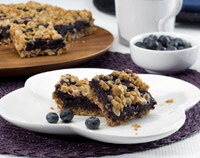 The healthy Blueberry Oatmeal Crumble Bar recipe below is perfect because it requires no knives - with blueberries there's never a need for chopping, dicing or peeling. Children can easily pile the fresh blueberries, crunchy oats and other ingredients into measuring cups. Just be sure to have extra blueberries for nibbling while you and the kids get cooking. Makes 9 - 2x2 inch squares. In a medium saucepan stir together all filling ingredients. Bring to a boil over medium high heat stirring often to reduce until mixture is thick and the berries breakdown, about 15 minutes. While filling is cooking make the crust. with remaining topping. Bake for 30 to 35 minutes. Cool before cutting. Calories 338, calories from fat100, fat 11gms, saturated fat7gms, cholesterol 27mg,sodium 72mg, dietary fiber 3gms, protein 4gms.